Two Interactive jobs in Vancouver. I always love it when I can post a good job opportunity. And today I can post two. The good people at Fjord Vancouver, the interactive wing of Cossette , Canada’s largest ad agency, is hiring two positions. The first job could be a good reason to move to Vancouver. The second is a mat leave replacement contract for one year. Rob Cottingham is smarter than any of us. I’ve written about my friend Rob Cottingham before. He scribes the fantastic web 2.0 cartoon Noise To Signal, which I’ve written about recently. Rob gave the keynote at this year’s Northern Voice, Vancouver’s major blogging and social media conference. I wasn’t able to be at NV09, but I knew when Rob’s keynote started, because I saw Twitter light up with fantastic praise, reviews and general hilarity. Rob Cottingham takes a lightning tour through both the intentionally and accidentally hilarious sides of social media, with a presentation that’s half stand-up comedy, half provocative treatise, and half meditation on why he can never get fractions to add up properly. He is just a truly funny man. Not just anyone could riff for twenty minutes on what makes social media funny. Rob can. So I am very excited that his keynote is now available for embedding, because I was truly bummed to have missed it. You can also download this clip to your iPod. PS: Rob can be found on Twitter, LinkedIn, Facebook, his blog and his Social Signal blog. It is my intention that within this single blog post you will go from not knowing who Rob is, to being intrigued, finding out more, learning all about him and then becoming totally sick of him. You’re welcome. PPS: The quality of this broadcast is phenomenal. See how it was done. Looking forward to Finance 2.0. A few months ago I was put in touch with Kristin Rodriguez at Financial Research Associates who was starting to put together a conference about social media and finance. She was calling it Finance 2.0, but beyond that she was simply seeking advice and support to put on a great conference. Over the next few weeks, we spoke a lot, and she caught on extremely quickly, talking to many of the best and the brightest in the online world of banking innovation. The result is that I’m on the advisory board of what should be an amazing conference at the intersection of community engagement and banking. Ron Shevlin – Why Are We Talking About Finance 2.0 When We Haven’t Figured Out Finance 1.0? Ed Terpening – Crashing the Party: Are Financial Institutions Welcomed on the Social Media Scene? My session is called Using Social Media to Connect With Your Community: It Really Does Change Everything. I’m excited and honoured to be sharing the stage with these amazing thinkers and experts. I am particularly excited to finally meet the amazing Ed Terpening in person. He will be chairing the whole event, and his take on things should prove illuminating and insightful. I’m also really excited to hear from Jeffry Pilcher. After meeting him this weekend at BarCampBankBC, and catching his energy and enthusiasm, plus after reading Gene Blishen’s review of a recent presentation, I imagine he will close out the two-day conference with a bang. 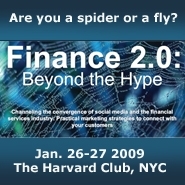 If you’re looking for a conference on the future of financial services marketing and engagement, check out The Finance 2.0 Summit – Channeling the convergence of social media and finance: Practical marketing strategies to connect with your customer. Coming to New York January 26-27th, 2009.